Let us start with a vector field . Consider over some closed surface , where denotes an outward pointing surface element. This surface integral is usually called the flux of out of . If is the velocity of some fluid, then is the rate of flow of material out of . since the vector area of a closed surface is zero. This definition is independent of the shape of the infinitesimal volume element. where is an outward pointing volume element. The proof is very straightforward. We divide up the volume into lots of very small cubes, and sum over all of the surfaces. 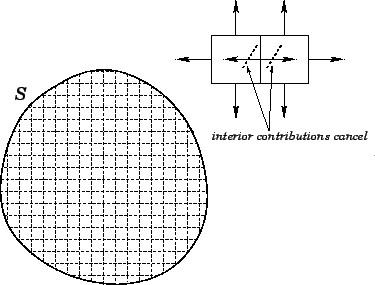 The contributions from the interior surfaces cancel out, leaving just the contribution from the outer surface (see Fig. 19). We can use Eq. (121) for each cube individually. This tells us that the summation is equivalent to over the whole volume. Thus, the integral of over the outer surface is equal to the integral of over the whole volume, which proves the divergence theorem. 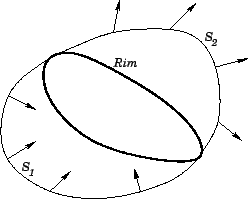 Thus, if then the surface integral depends on the rim but not the nature of the surface which spans it. On the other hand, if then the integral depends on both the rim and the surface. This is called the equation of continuity of the fluid, since it ensures that fluid is neither created nor destroyed as it flows from place to place. 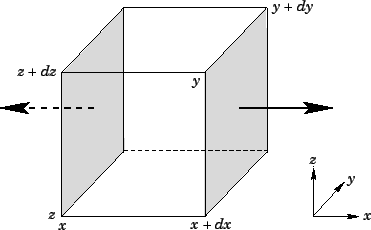 If is constant then the equation of continuity reduces to the previous incompressible result, . If then there is no net flux of lines out of any surface. Such a field is called a solenoidal vector field. The simplest example of a solenoidal vector field is one in which the lines of force all form closed loops.